Ah, summer. These are the only reasons I stick it out in New York the rest of the year. It all began with my first summer here, as a wide-eyed, twenty-year-old college sophomore. It was every bit the definition of “salad days” – living in Alphabet City with my best friend in an apartment we rented ridiculously cheap because it was owned by her family friends, romping around the Village and Lower East Side, sometimes successfully sneaking into bars, sometimes not, but always having an adventure. There was nothing very “salad”-y about our diet then, if you counted out deviled eggs (one affordable luxury and my ex-roommate’s penchant). And lord knows I didn’t make it to the grocery store much. But I think the term fits — New York is full of contractions, right? And last weekend marked the beginning of another summer. It doesn’t matter that temperatures get hot enough to melt blacktop, or that people dress down with such abandon as to fill your morning commute thoughts with rants in the vein of Vice Magazine’s Don’ts. Summers are great because there’s just more stuff happening. There’s more weird parades, outdoor music, empty pool parties and assorted mayhem to attend to. More lawn-top, rooftop and riverside film festivals to see. More on-the-fly barbecues, fireworks and flings. And it seems like people are doing more and more with their barbecues and food parties than ever; that everyone who has a yard of outdoor space wants to be a master smoker or attempt to roast a whole pig. I digress, but what I really wanted to talk about was how this all tied into chicken salad. You see, it’s the dawning of a newer, more sophisticated era of chicken salad for me, right now. This is a dish that I had formerly shrugged off as pedestrian and often unappetizing. But no more sad, barely seasoned, celery studded and thickly mayonnaised-only chicken salads there will be. Not after this past weekend, when I invited several friends for a picnic in Prospect Park, the theme dish being chicken salad. Why chicken salad? Because I thought it would lend itself to endless variation, transportation, and require little utensils or disposable plates. 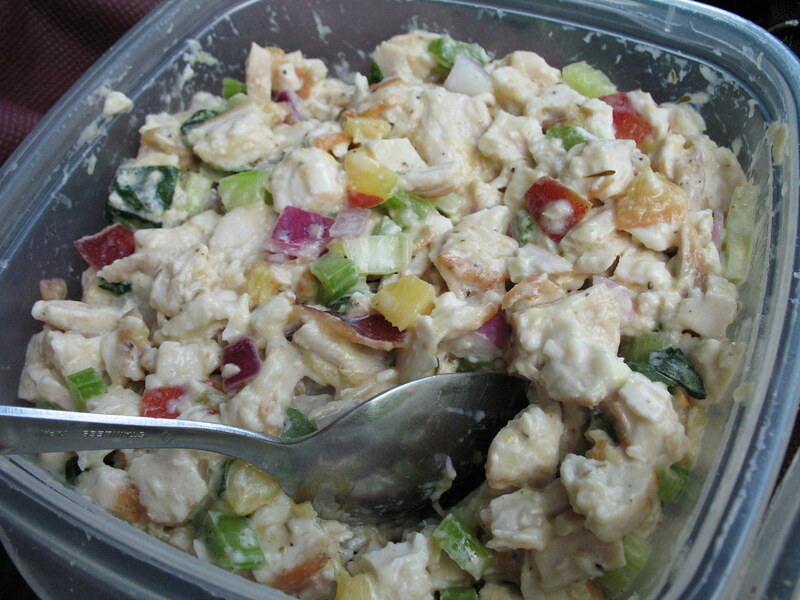 But mostly, because it would lend itself to endless variation, including even vegan “chicken” salad. Guests did not disappoint on this. Among the ingredients thrown into all the varieties combined were mushrooms, peppers, bacon, walnuts, radishes, nectarines, smoked paprika, basil. Etc. Though summer officially began on Friday, Saturday’s summer solstice, or the longest day of the year, was one of those exceptionally sunny yet mild days we see so rarely. Appropriately, I probably spent the longest time I’ve ever in the park, eating and hanging out, and when the evening gave way to dinnertime cravings, there was plenty of food still to go around. We even stuffed split sugar snap peas that someone brought with chicken salad and created a new sort of snack. By the end of the night, I was eating chicken salad(s) straight from their containers with a fork. I am not proud of this moment, but what’s done is done. One of the reasons I got started on this idea was when, over drinks with a friend — the same friend who I spent my first summer with in the East Village — she mentioned something about how eating cold chicken felt so right in the summer. Coldness transforms the poultry to a completely different, firmed-up texture with locked-in flavors that grow on you with every bite. Throw all ingredients for the marinade into a blender or food processor and blend until completely combined. 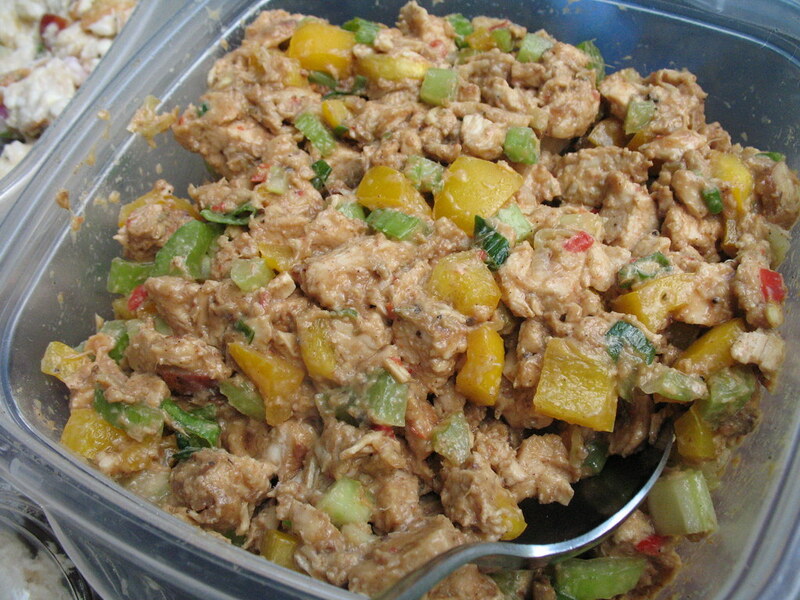 Place chicken in a bowl and pour marinade over to cover. Wrap tightly and chill overnight. Preheat oven to 375 degrees. Heat up a grill or large pan that can be transferred to the oven with a couple tablespoons of vegetable oil. Remove chicken from the marinade with tongs and let excess drip off a few moments, or shake gently (reserve marinade for later use). Once oil is hot, place chicken down on pan and leave for 1-2 minutes. Check to see if bottom is nicely browned and caramelized and if so, flip and cook on opposite side another 2 minutes. Once it’s well browned (but not burnt), transfer pan to the oven and let cook 6-8 minutes, checking occasionally, or until meat is just cooked through. Remove from pan and let cool. Meanwhile, pour the leftover marinade into a pot and heat on medium high on the stove. Let boil, and reduce to about one-third (about 5-6 minutes). Remove from heat and let cool. 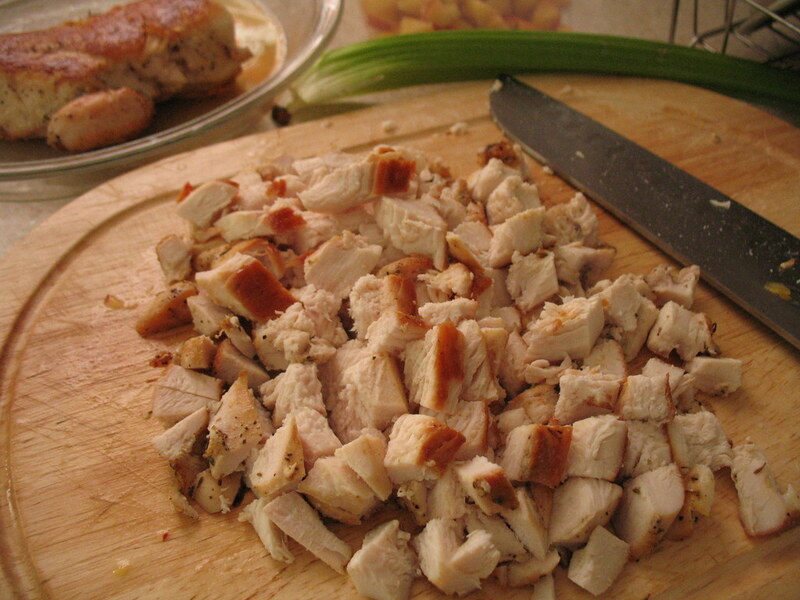 Once chicken is cool enough to handle, chop into 1/4″ cubes. Combine with the rest of the ingredients for the salad in a large bowl. Add the reduced marinade (should be sticky and almost solidified). Mix thoroughly and adjust seasoning to taste. Chill at least 1 hour before serving to let flavors marry a little. Rub chicken with ingredients for the marinade; cover tightly and chill for a few hours or up to overnight. Preheat oven to 375 degrees. Heat up a grill or large pan that can be transferred to the oven with a couple tablespoons of vegetable oil. Once oil is hot, place chicken down on pan and leave for 1-2 minutes. Check to see if bottom is lightly browned and if so, flip and cook on opposite side another 2 minutes. Once it’s well browned (but not burnt), transfer pan to the oven and let cook 6-8 minutes, checking occasionally, or until meat is just cooked through. Transfer chicken to a bowl and let cool. Once cool enough to handle, chop chicken into 1/2″ cubes. Fold together with the rest of the ingredients for the salad in a large bowl. Cover and chill at least 1 hour before serving to let the flavors marry. Five brownie points: Talking about both recipes in general, here, there are a lot of pros. Both employ vibrant, fresh veggies almost in equal ratio with the proteins. Almost. In the first recipe, the flavorful, reduced marinade creates most of the sauciness that would usually be achieved through fatty mayonnaise. In the second recipe, there’s a little more mayonnaise to go around but a lot of simple, fresh ingredients with little embellishment. 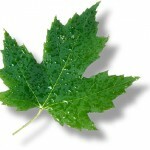 Five maple leaves: Again, not great, but not bad, either. The chicken was organic, picked up from a regular grocery store actually at a marked-down sale price. (There wasn’t time to check out a Greenmarket producer on Saturday since the picnic was the same day.) I am trying to remember why I had a nectarine lying around and just came up with it: I pick up fruit from a Midtown street vendor every now and then, when I’m feeling snacky at work. So I bought nectarines one day, at two for a dollar. They’re not in season in the Northeast yet, though you wouldn’t know it from the way they’re all over the street, literally, as well as generic groceries. The yellow bell pepper, too, must have been shipped in from the West Coast to the Caribbean bodega in my ‘hood. But the scallions, red onion and celery were all Greenmarket purchases. yummy! 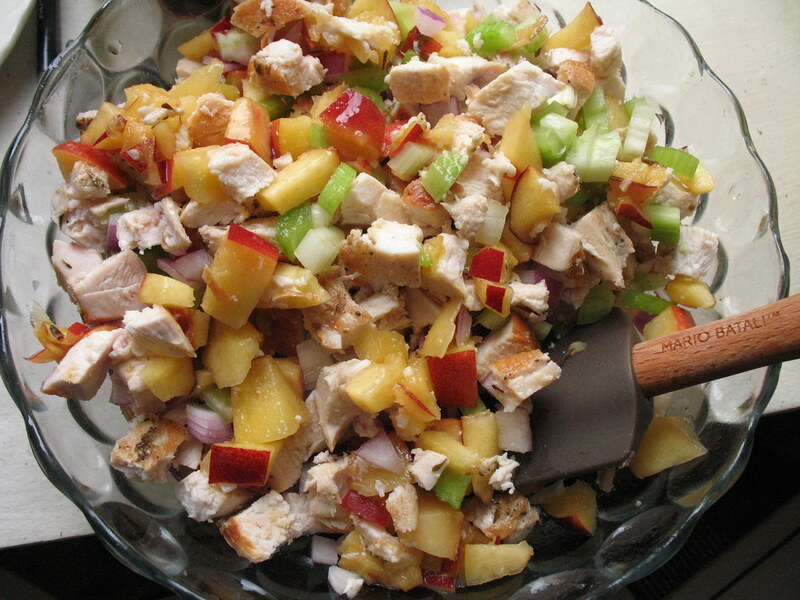 chicken and fruit go together like chicken salad and summer. even though i’m anti-mayo i’m sure i can toss up a suitable likeness to the nectarine and basil heaven. thanks lady. I am not usually one for chicken salad but i’m def going to make this jerk chicken rendition! 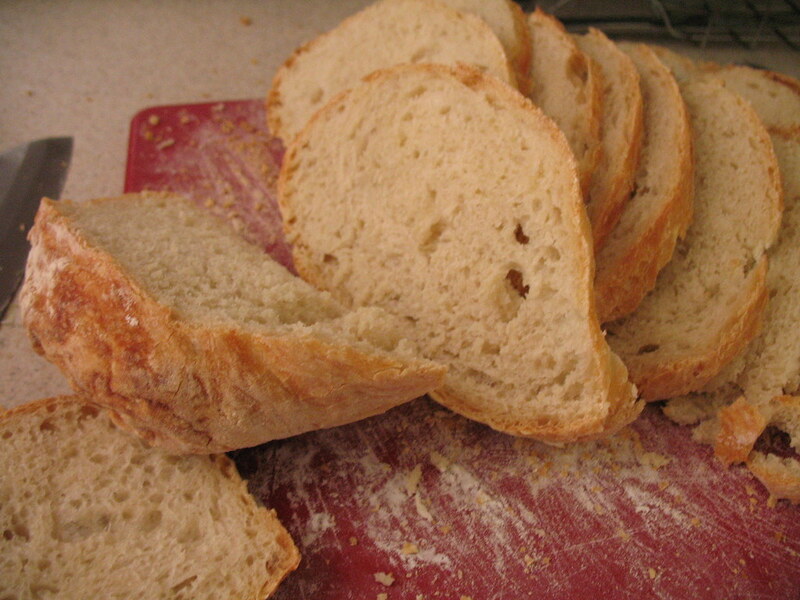 Thanks for the recipe….im going to use it as an excuse to plan a picnic! I agree, most of the time people overdo the mato, to the detriment of the chicken/avocado/lettuce…. I am more than seduced by the nectarine and basil version! Jerk chicken salad? Brilliant and yummy!! I do a version with Moroccan spiced chicken and apricots… but I love this idea. 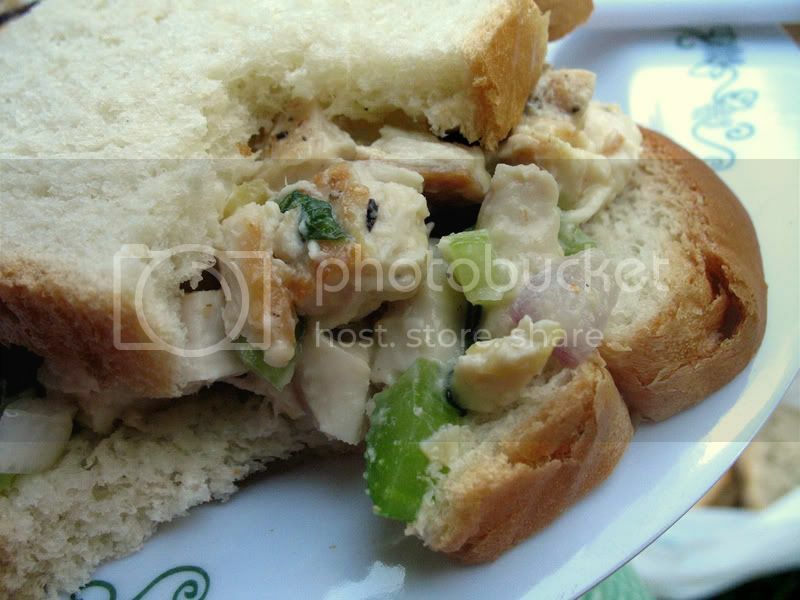 Wow–jerked chicken salad! It sounds fab! 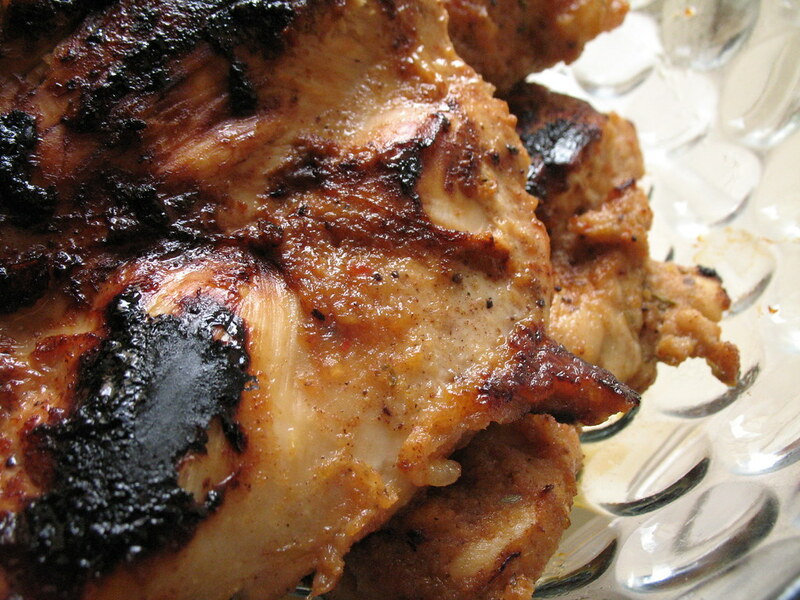 I love jerk anything–the first time I had cold jerk chicken was on a boat in Key West. Delish… cold and spicy all at the same time is perfect in my book. 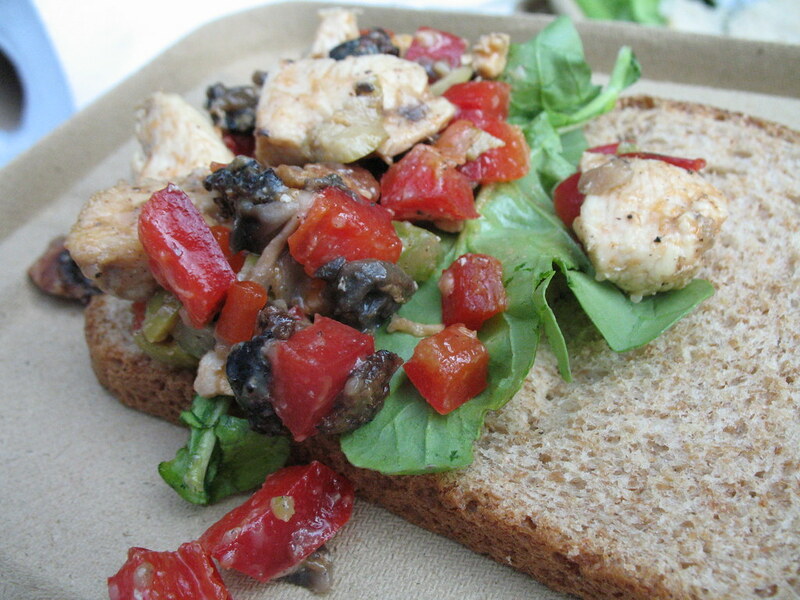 A chicken salad picnic is a great idea, too! I’m sure you had a lovely assortment. I make a fun curried-peach-chicken salad using peach yogurt to cut the mayo, along with nuts and sliced grapes; it’s wonderful wrapped up in lettuce leaves. Your party also reminds me of many years ago when I lived overseas–we were all pretty poor back then and had this tuna salad party with an assortment of breads and add-ins and chips. It was one of the best parties I’ve ever attended.